22-Nov-2013 Local press announces the progress of our volunteer stitchers in the Canadian city of Guelph. Well aware of the important Scottish connections to Guelph in Ontario, we were keen to get volunteers there excited about the Tapestry. Things got off to a slow start, but have recently burst into life with a flurry of activity. Great news! 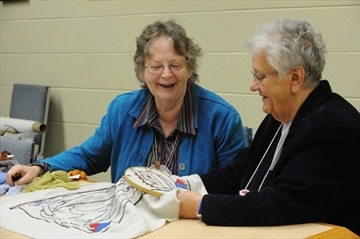 Twice a month, a few dozen enthusiastic embroiderers gather in a Guelph church where the majority spends their time on various projects, from decorative boxes to wall art. Amid all this industry, one member slips her needle through a piece of history: a panel depicting Guelph's intrepid Scottish founders. 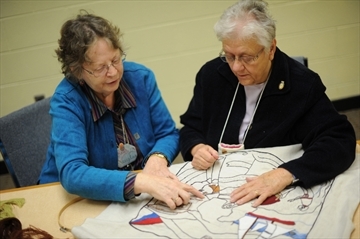 Members of the Canadian Embroiders Guild Guelph volunteered to stitch one linen panel as part of an international tapestry project which will culminate with a major exhibition at Scotland's 2014 homecoming celebrations. The tapestry celebrates Scottish emigrants throughout history. "They (Scotland) were doing one for the Diaspora, for all who left Scotland and had impact around the world," said guild member Alison Jackson, who came to Canada from Scotland 40 years ago and lives in Cambridge. "I thought of John Galt," she said. "He founded Guelph and named it Guelph after the royal family. There was also Tiger Dunlop. Together they opened up the Huron Tract Road from Guelph to Goderich." With such a rich Scottish history right in her backyard, Jackson was rippling with excitement over being part of the tapestry project. Unfortunately, she missed the Scottish touring group who had come to the University of Guelph to talk about the tapestry project several months earlier. Their efforts failed to incite local interest. "Nothing was happening," said Jackson, who stumbled on the tapestry project information from the Scottish tourism board. Undeterred by the lateness of their entry, Jackson and her fellow stitchers came up with a concept based on local Scottish history, then sent it off to the project organizers in Scotland. The project started rolling in September 2012 and anyone who submitted a proposal on time was given a design created by Andrew Crummy, a well-known Scottish artist. The Guelph group, however, was about four months too late. Luckily, the membership includes the multi-talented Ruth Douglas of Fergus, who drew plans for a tapestry panel and sent it to Scotland for approval. "Ruth did the design to expedite things," said Jackson. Douglas added "it was kinda fun and Alison did the research." After making a few minor additions to the design, the panel was returned to the Guelph ladies along with enough embroidery thread to complete the project. That was in December and since then interested members of the guild have taken turns working on the panel. Jackson said "some just wanted to put a few stitches in, just to say they were part of it." The final design includes images of adventurous Scotsmen such as John Galt, Charles Prior, Bishop Alexander Macdonell and Dr. William "Tiger" Dunlop, all who are credited with breaking open this area of Ontario for settlement and commerce. The Scottish Diaspora Tapestry was the brainchild of Prestoungrange Arts Festival in Prestonpans, Scotland, with a lot of government and public support. The idea was to create an impressive tapestry by drawing on the talents of Scots around the world. 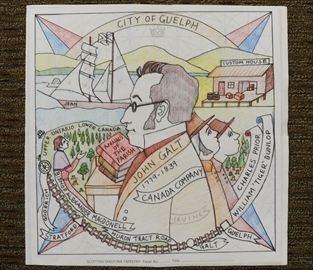 The Guelph tapestry is just one of dozens of embroidered panels that are being handcrafted in communities in 25 countries. The Diaspora project was inspired by the 105-metre Battle of Prestonpans Tapestry, designed by Crummy and embroidered by more than 200 stitchers. That tapestry depicts the 1745 campaign of Bonnie Prince Charlie when he led an insurrection to restore his family to the throne. That tapestry toured England and France. This new tapestry is a much larger project, with a worldwide reach. Once the stitching is completed, all panels are shipped off to Scotland to mount the panels on individual stretcher frames, creating a flat surface. Both the Diaspora and the Battle of Prestonpan tapestries had an earlier influence, the magnificent bit of stitchwork known as the Bayeux Tapestry. At 70-metres in length, the intricate embroidered cloth was made around 1070 depicting events leading up to the Norman conquest of England. The Bayeux Tapestry is housed in its own museum in northern France. The Scottish Diaspora Tapestry will be much more travelled, sent to all the communities that contributed after homecoming. "The plan is they're going to send it around the world," said Jackson. Link to online version of the original article here.